"The Woodpecker" is one of William Morris's most loved wall tapestries. 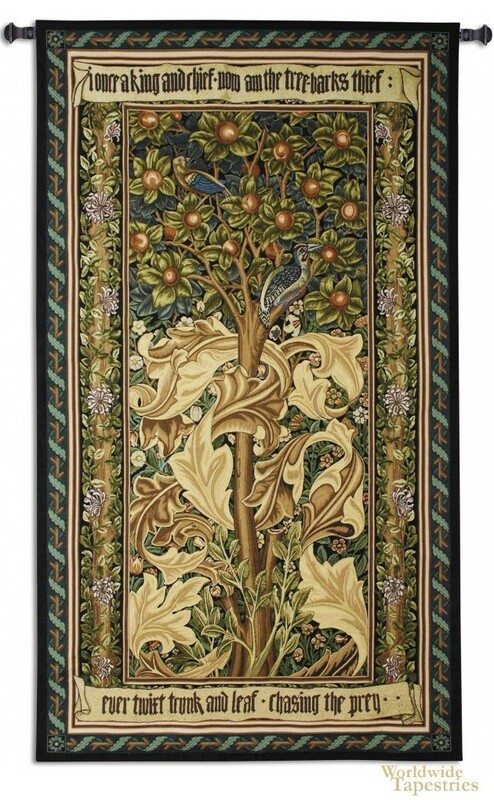 Here in this tapestry based on this famous work "William Morris Woodpecker" we see an elaborate woodpecker sitting in a fruit tree, wrapped and surrounded by a rich design of acanthus leaves, a signature of his works. This tapestry was unusual in that it was one of the few tapestries that Morris designed himself in its entirety. His hallmarks of his pronounced acanthus leaves are ever present, and in this piece, the color palette is remarkably rich and evocative. The browns and beiges of the acanthus leaves complement the orange of the fruit, and the greens and blue greens of the leaves complement the lilac that emerges from the flowering vines. This tapestry is based on a poem about Picus, the ancient Italian king who was turned into a woodpecker by the sorceress Circe. This piece is remarkable for its design which bears the signature elements of William Morris beautifully. This tapestry "William Morris Woodpecker" is backed with a lining and has a tunnel for ease of hanging. Note: tapestry rod and tassels, where pictured, are purchased separately. Dimensions: W 41" x H 72"